There’s been an awful lot of apples and cider, sage and rosemary, molasses and brown sugar thrown around in my kitchen this fall. And plenty of pork. I feel like I’m heading into a flavor rut, yet I can’t help myself; these ingredients just sing fall and it’s exactly what I’m craving this time of year. 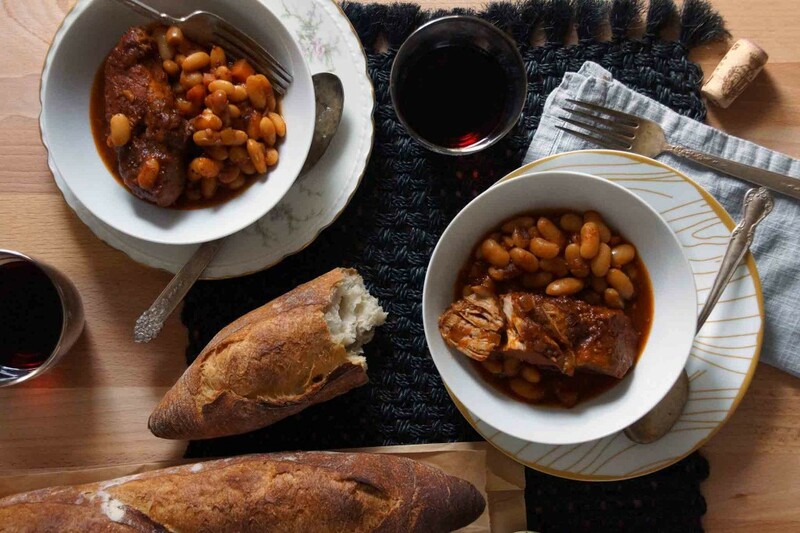 So even though I’d been planning to shake things up a bit last weekend, I was dying to try a recipe for slow-cooked cider beans I’d seen a few days before. They looked like an autumnal take on baked beans, one of my favorite guilty pleasures of summer. 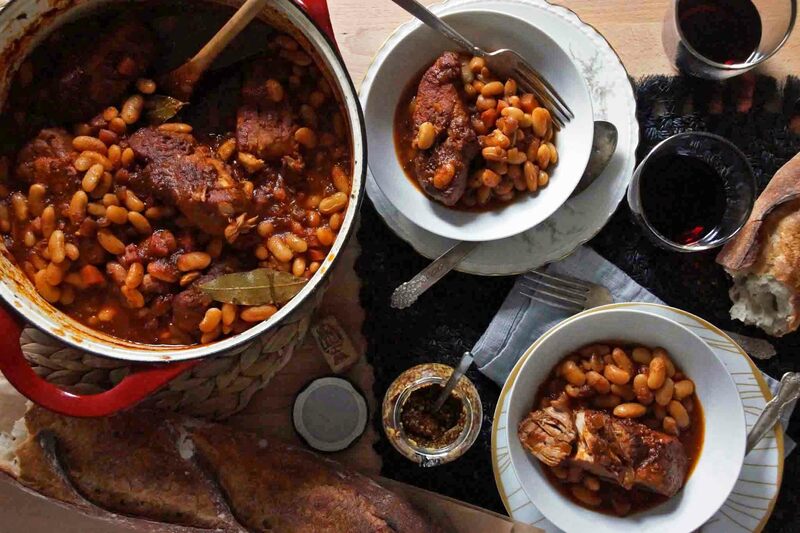 In the recipe, beans are simmered in apple cider with molasses and mustard. I decided to make it my own and braise country style pork ribs along with the beans. And I’m glad did! I’m glad I didn’t try too hard to reroute my food rut because it ended up being totally delicious and exactly right for a fall weekend. Get into your comfort zone and get cooking. I recommend pairing this cooking project with wearing slippers, sipping wine, and listening to NPR. Yes, I’m that total homebody nerd. You’ll need to soak beans overnight. I used Cannellini beans, but great northerns would be fine too. We’re using “country-style” pork ribs which are not ribs at all, rather strips of meat cut from the shoulder that ressemble the size and shape of ribs. 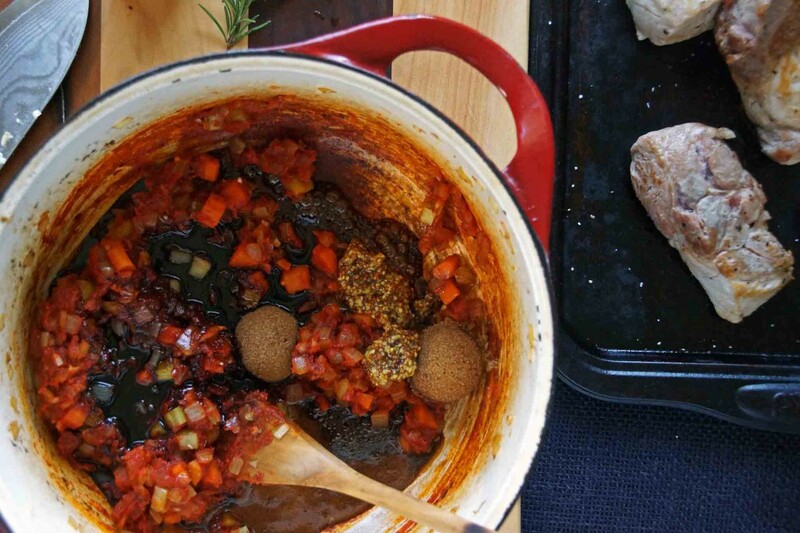 Grab a jug of good apple cider, molasses, grainy mustard, carrot, celery, onion, garlic, rosemary, bay leaves, and tomato paste and you’re ready to get cooking. Season the pork with salt and pepper and sear it off. Dice the carrot, celery, and onion, mince the garlic. 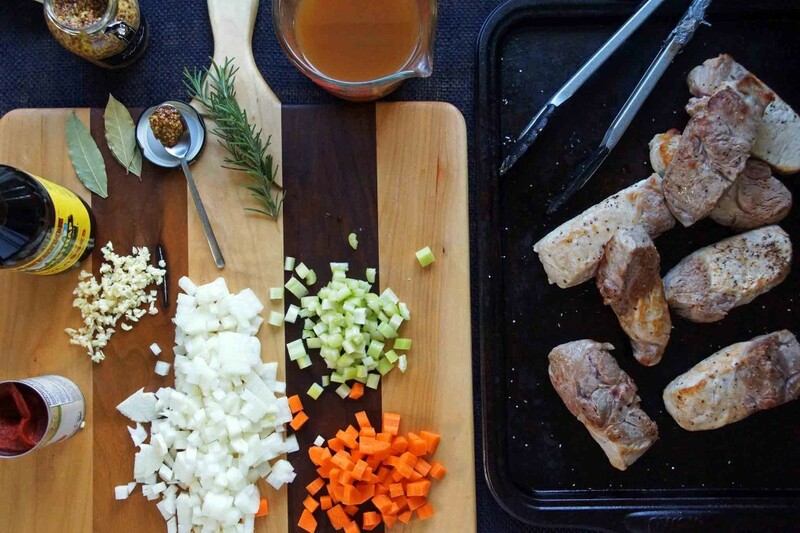 Sauté the carrot, celery, and onion, then start building the braising liquid. Add tomato paste, brown sugar, molasses, and whole grain mustard. Add the cider, some stock, rosemary, and bay leaves, then nestle in the seared pork. Bring the liquid to a boil, then reduce to a simmer and let it slowly bubble away. Once you’ve gotten to this point, you should get your beans cooking. Drain them from the water they’ve soaked in, put them in a saucepan with fresh water, and simmer. When the beans are cooked, your ribs should be well on their way to being totally tender. 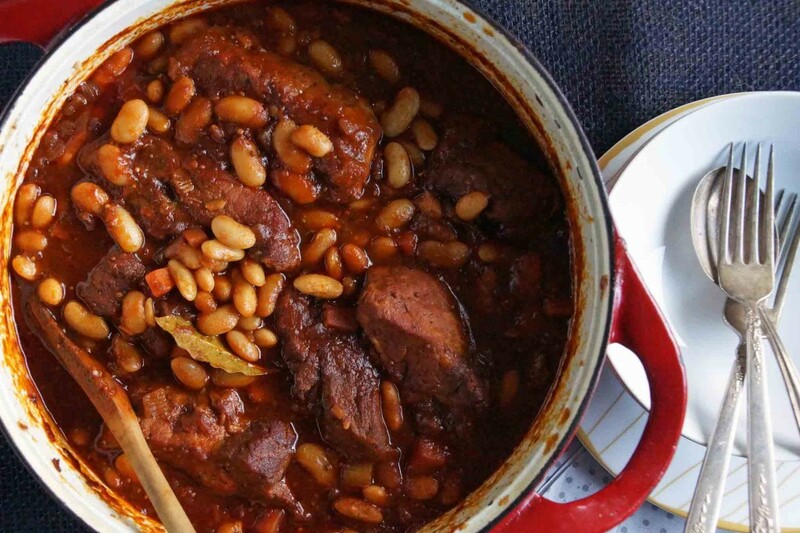 Add the beans to the braising pork and let the flavors marry for a final half hour simmer. Time to eat! Serve the beans and pork ribs over soft parmesan polenta or on their own, with a hunk of crusty bread, a little extra mustard, and a big salad. Sure, I may have dug my food rut a little deeper with this one, but can you blame me? Some ruts are just way too delicious to escape. 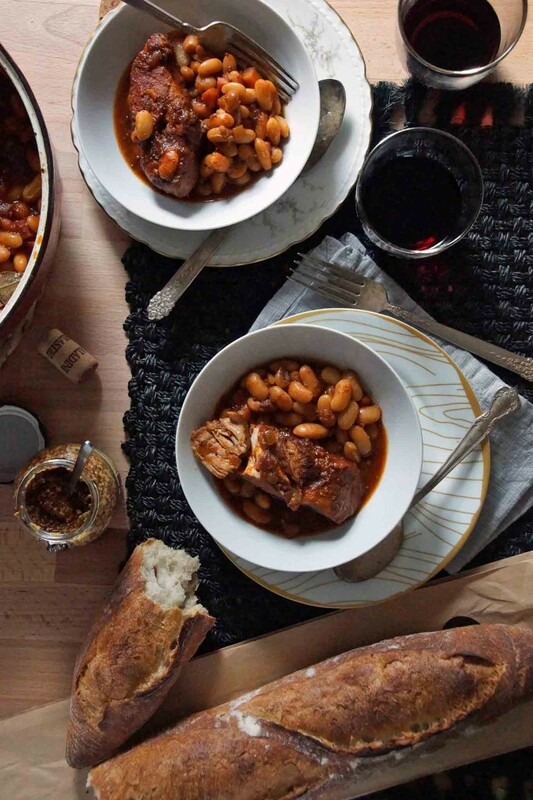 Serve the beans and pork with good, crusty bread or over a bowl of polenta. If you have leftovers, try shredding the meat and using it to dress pasta. Liberally season the pork with kosher salt and pepper. Coat the bottom of a Dutch oven with olive oil and place over medium-high heat. Working in 2 batches, sear the ribs on all sides, 1-2 minutes per side. If the pan gets too dry, add a little more oil. Once seared on all sides, transfer the seared pork to a platter. Now we’ll start building the braising liquid. Add a little more oil to the Dutch oven (unless enough remains from searing the meat-you just want a thin coating). Add the diced onion, carrot, and celery along with a pinch of salt. Sauté over medium-high heat until the onion starts to color and the carrot and celery soften slightly, about 8 minutes. Use a wooden spoon to scrape up any brown bits of meat that might be stuck to the bottom of the pan as you go. Add the garlic and sauté for another minute. Clear a spot in the pan and add the tomato paste. Cook the tomato paste for a minute or 2, then stir it into the vegetables. Add the mustard, sugar, molasses, vinegar, and a good pinch of salt. Stir. Add the cider, stock, rosemary, and bay leaves. 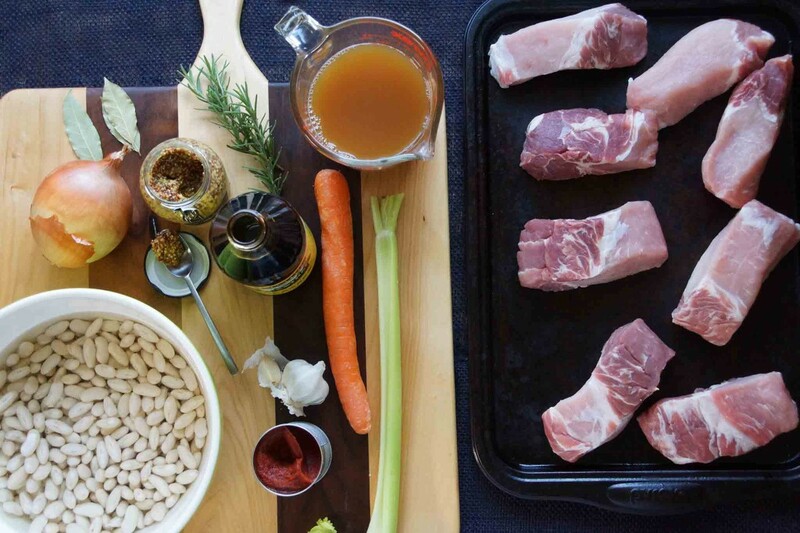 Return the pork to the pan and bring to a slow, steady simmer. Simmer, partially covered until the pork is fairly tender, about 2 hours. 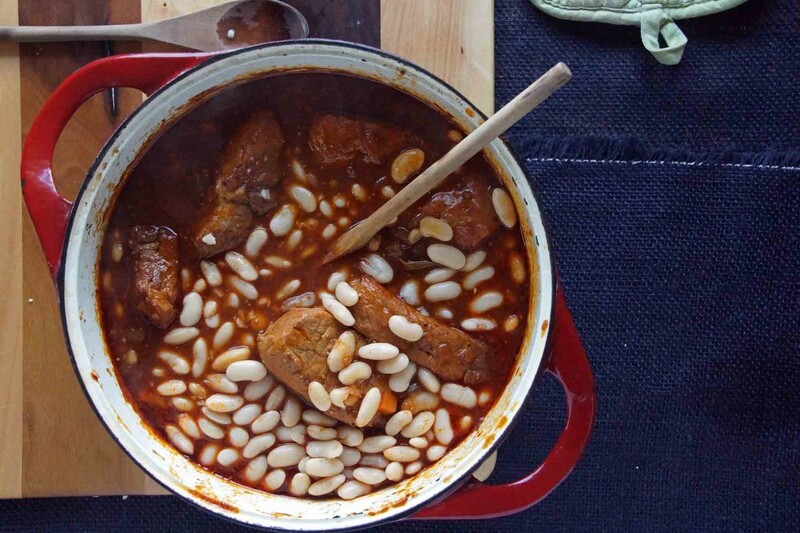 Once you get the pork braising, you should cook your beans. Drain them and place in a saucepan, covered by about 1 in. cold water. Bring up to a boil, then reduce to a simmer. Simmer, covered, until tender, about 1½ hours. Drain. Add the beans to the braising pork. Add a little more salt to season the beans. Simmer together, letting the flavors meld, until the pork is very tender, another 30 minutes. This looks absolutely perfect for chilly weather! Can’t wait to try! P.S. Been meaning to tell you how much I love your food photography. Your pics are always styled and lit so simply and beautifully. Cheers! I find it challenging to take pictures of food since there’s such a brief window between cooking it and eating it, but I do what I can. Thanks, Robin! Sarah- I made this tonight and it was delicious. Fall in a pot. This is the third thing I’ve made from your blog ( pasta with pumpkin and caramelized onions and pumpkin gingerbread cake ). Your recipes are great and we seem to love the same flavors. My brother-in-law is John Louis. So glad he told me about your blog! I will be reading faithfully. Fall in a pot…that’s exactly what I was going for! I’m glad John turned you on to my site and happy you’ve had success with my recipes. Thanks for reading! 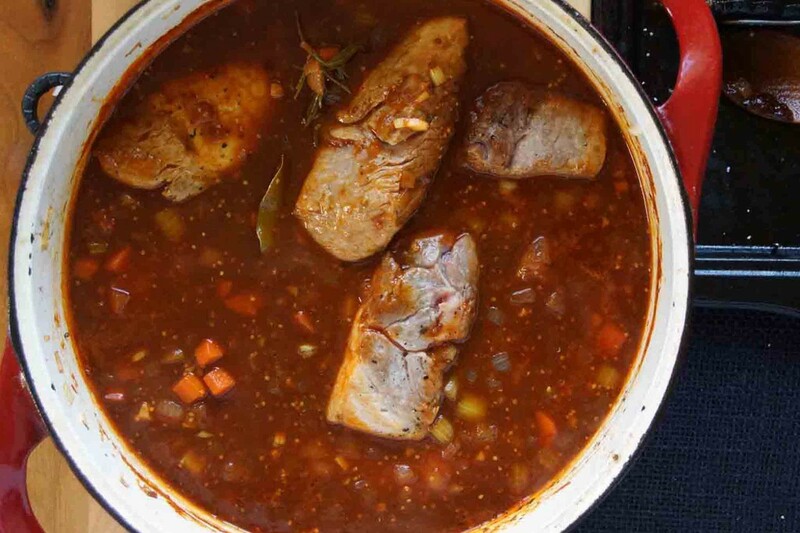 I made this cider braised pork yesterday and I loved it! The flavors are just amazing! 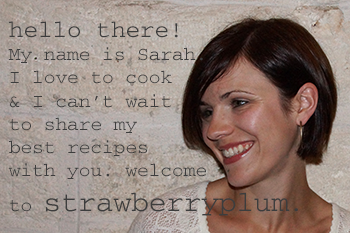 I really enjoy reading your blog and I have tried several of your recipes. Thank you for always letting us know about your new and tasty recipe creations! Thanks, Jenny, it’s my pleasure! Could you please tell me what the amount is for the country style ribs – the recipe says 3# boneless country style pork ribs – does this mean 3 pounds? Maybe this is a common symbol for America but I am in Australia and I have no idea what it means. Many thanks. Jenny. Yes, it’s 3 pounds. Hope you enjoy the pork!